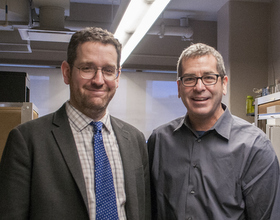 Professor Marom Bikson [left] and Miles O'Brien at City College after discussing the CCNY study of the Thync device for a January 2015 episode of the "PBS Newshour." To test a revolutionary device that has been the buzz of the scientific world in recent weeks, the startup Thync turned to City College of New York biomedical engineering ProfessorMarom Bikson. At his world-class neuromodulation lab in theGrove School of Engineering, Professor Bikson led a study that validated if the revolutionary device could change moods in a single session of use and keep them elevated over six weeks of use. Approximately 100 City College students and staff participated in the trial this fall funded by a grant from Thync. Dr. Lucas Parra, professor of biomedical engineering, also worked on the study. According to Professor Bikson, they discovered that electrical stimulation to the head through electrodes connected to a smartphone could produce a calming effect. The current was low intensity and painless. The CCNY study and Professor Bikson’s work will be documented in an episode of “PBS Newshour” produced by TV journalist Miles O’Brien in January. Professor Bikson’s research group studies the effects of electricity on the human body and applies this knowledge toward the development of medical devices and electrical safety guidelines. The lab has developed or validated new technology that is in use in over 200 medical centers around the country and world.